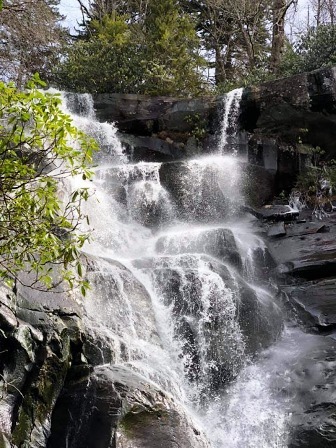 Ramsey Cascades is not only one of the Great Smoky Mountain's most beautiful waterfalls and it's also the tallest! Standing 100-feet high, these falls cascade through roughly 7 tiers of huge rocks into a pool of Salamanders. Getting there can be a challenge somewhat, however, it's worth the trip! This 4-mile-one-way hike is recommended for the more experienced hiker. The trail to Ramsey Cascades begins with a residuum road filled with gravel. It tends to get a big rugged, especially around the last third-of-a-mile. There is an old cul de sac about a half mile from the trailhead marking the conjunction of the old Greenbrier Pinnacle Trail. This trail led to an old fire tower which remains over-grown and dilapidated today. You'll continue eastward to the falls on a footpath that tends to be somewhat narrow. If you have young children hiking with you, make sure you watch them closely! Never try to climb the rocks of these falls! They're very slippery! Death has occurred several times during the attempt! Ramsey Cascades remains quite popular in spite of it's arduous walk. As you move along, you can expect to run into other hikers on the trail. Watch for the black bear! They do reside in the area! Once you arrive, you will see for yourself that it was worth the trip! These falls, as with any other become more full after a rainfall. Be sure to have a camera ready! It's quite a site to behold! do not attempt to climb these falls! people have been killed trying to do so!!! Ramsey Cascades is located in the Greenbriar Community of Gatlinburg. To reach the falls, you must begin from the Trailhead at the junction of 441 and 321 in Gatlinburg. At light #3 go east onto 321. Travel 6 miles before turning right into Greenbrier. Go straight on this road which turns into a gravel road. Drive about 3 miles from Route 321 until you come to a fork. Turn left and cross a bridge. You'll arrive at the trailhead in about 1.5 miles. Located Inside Gatlinburg inside the Greenbrier Community. Bring a flashlight and extra batteries. A day's supply of food, and lots of water. Bear spray - The Black Bear is active in this area! Emergency covering such as a tarp, or tent. Good Hiking boots, or shoes must be worn. Pets are NOT allowed on this trail.